Gaza rejects reports Hamas to send military aid to the Houthis in Yemen, say Iran is trying to torpedo new relationship with Saudi Arabia. Hamas has strongly denied a Fars news agency report which claimed that leader Khaled Meshaal would send hundreds of Hamas "military wing" fighters to help in the war against the Shi'ite Houthis in Yemen. Sami Abu Zuhri, a Hamas spokesman, said that this report is untrue, since the Saudi leadership did not present the idea. He said the report was intended to harm Meshaal's visit to Saudi Arabia and to incite against Hamas. Nevertheless, the two sides have been getting closer over the past year. The speaker of the Iranian parliament, Ali Larijani, recently boasted that Iran provided Hamas with the technology it has used to rain down rockets on Israel from Gaza, and Hamas later thanked Iran for providing the group with the rockets. The Al-Hayat newspaper revealed several months ago that Hamas leader-in-exile Khaled Meshaal met with Iranian Revolutionary Guards commander Qasem Solemeini, in Turkey, just days after the end of Operation Protective Edge in Gaza over the summer. That relationship may be at risk, however, as Hamas and Saudi Arabia reunite to battle Islamic State (ISIS) within their borders - and as Iran and Saudi Arabia continue to battle over a proxy war in Yemen. 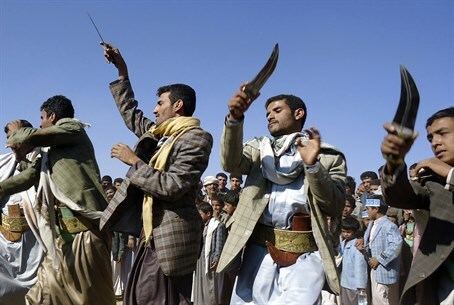 A Saudi Arabian-led alliance began launching airstrikes on the Iranian-backed Houthi rebels on March 26 of this year.